I just finished my African Fabric Quilt! This quilt was so fun to make for several different reasons. To start with, the fabrics used were Christmas gifts from my family. The African type fabrics were from Mike and Erica and I couldn’t wait to use them in a quilt. In addition, my brother and his family sent me this cool assortment of fat quarters that each member of his family picked out and so I used a bunch of those as well! The white fabric actually came from two re-purposed old work shirts of Mike’s. Quite the family affair! I also really enjoyed making the blocks. The center blocks and inner border blocks came from patterns in Tula Pink’s book. I was really pleased with how those two blocks came out with the fabric I was using. It seemed like the block design matched the fabric in a neat way. Lastly, I put together my favorite border…my own crazy mixed-up, mash-up. There is nothing better than a chaotic collection of color. I love how it just bellows “COLORFUL BRIGHTNESS!” at you! 🙂 My friend Sondra will be quilting it for me soon so I’ll post one more picture when it’s finished. Linking up to all sort of great sites 🙂 Whoop Whoop Fridays at http://confessionsofafabricaddict.blogspot.com/?wref=bif and Needle and Thread Thursdays at http://myquiltinfatuation.blogspot.com and Crazy Mom Quilts at http://crazymomquilts.blogspot.com/?wref=bif and TGIFF hosted by That’s Sew Julie at http://thatssojulie.blogspot.ca/2014/01/tgiff-small-finishes.html and Richard and Tanya Quilts at http://richardquilts.blogspot.com/ Thank you Ladies & Gentleman for letting me share with you! I love to click on other people’s sites and go visiting!! And the creative juices keep flowing! I like the way you mixed solids with the African prints the border, and those Grecian crosses in the centre. Hi Brenda, thank you! I loved your post from yesterday showing the colorful checks. The colors are great and I think the gold thread you used for the quilting was such a neat touch! I also really love the applique you are working on – the one with the scrappy flowers and scrappy leaves. WOW – those are really pretty! Can’t wait to see those when you are finished, especially those leaves! Wow that is bright and beautiful. I love the twisty turny way you have that second round of blocks set up. So pretty! 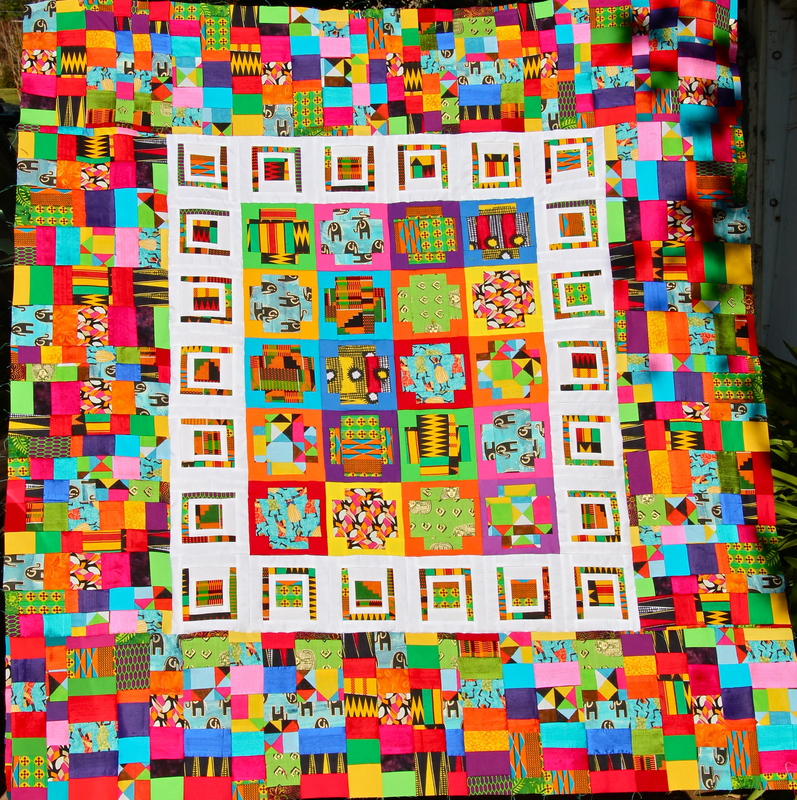 I really loved your site’s lead picture – the sunshine quilt. That is a stunner!!! WOW! Have you done more like that? And was that paper pieced? I’ve never done paper piecing but I’m seeing more and more of it on the different blogs and was curious. Have a great day and I look forward to seeing more of your posts! That is such a bright and colorful finish. I like that pattern as well. Well done and thanks for dropping by and leaving lovely comment. Thanks Vera! I look forward to seeing more of your projects! So much wonderful colour. Love it. The blocks you have chosen are great. It is a fantastic quilt. My eyes are in heaven looking at this beauty!! Hi Sara – thank you 🙂 The colors were a little darker than I usually work with, but it was a lot of fun to make. I think using the Tula Pink blocks really made the fabrics shine. Have a great day! This is so bright and cheery. What a fun use of Christmas present fabric. Thanks for sharing and for linking up with TGIFF! what a fun, happy explosion of color! It’s so pretty! Thank you Kelly 🙂 Thank you for hosting the Needle and Thread Thursdays! I have clicked on so many neat websites as a result. Lots of fun!! Wow – gorgeous bright colours! Hi Amanda – thank you 🙂 I can’t wait to get it back from my friend who does all the quilting. Should be really fun! ← Dog Lap Quilt – Just for Fun!